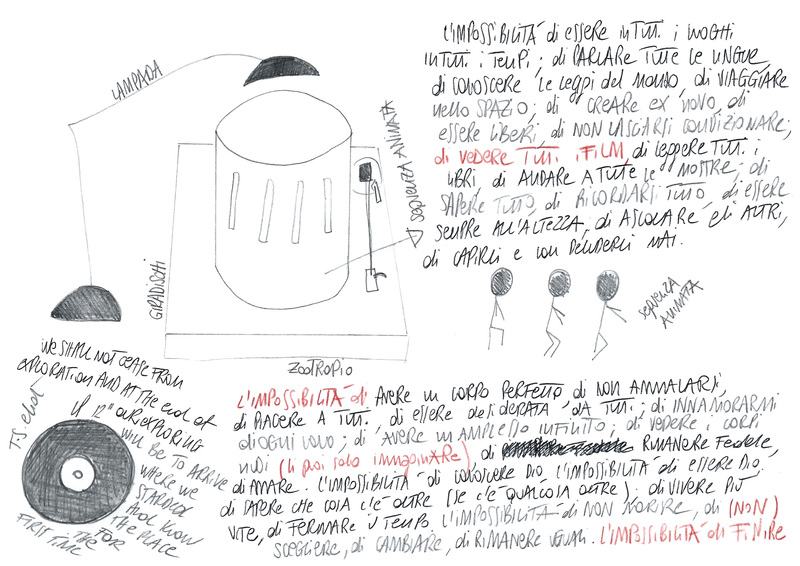 In the project “Loop” the artist revisits ancient devices which were important for the invention of cinema (zoetropes, praxinoscopes, kinetoscopes, magic lanterns…). These instruments were based on repeated sequences of images, which consisted of actions in loop, and they narrated stories with few frames in motion. Although the loop might be conceived as a technical limitation, on the contrary it becomes a narrative engine, as Lev Manovich has stated in his book “The Language of New Media” (2001). Indeed, each photographic sequence tells a story, which in its persistent and obsessive repetition is a metaphor for human limits. This cyclic time follows the natural dimension of things, abandoning the theleologic Christian world view. Through a self-portrait within an aseptic and minimal space the author often refers to literary figures, history of art and mythological archetypes, in order to achieve a transformation into “otherness”.